Being seen in the darkness is a necessity for cyclists. Whether they are out on a training ride or cycling home from work in the winter, being seen on the roads can be the difference between life and death. There have been 18,477 recorded injuries to cyclists in the UK in 2016, with 102 of those deaths and at least 3,397 serious injuries. 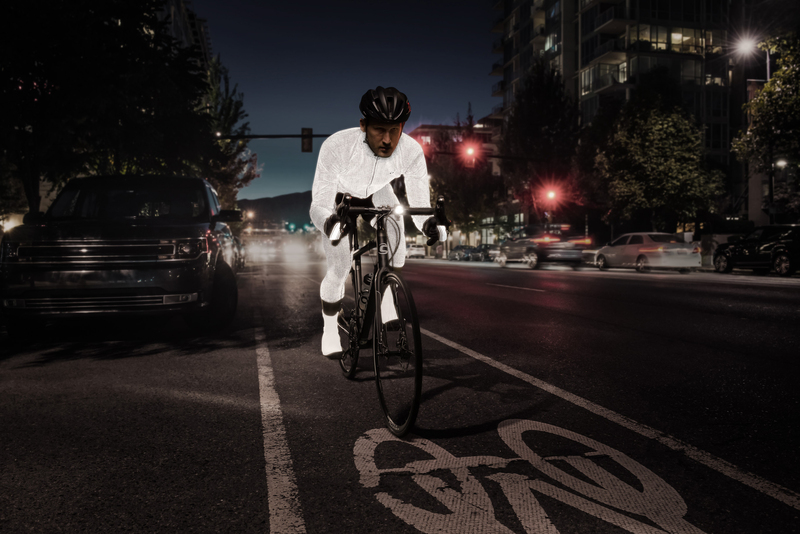 Visibility is a problem with potentially serious consequences and we have been asked by multiple brands to identify the visibility of their night time cycling apparel. Progressive have built up a strong knowledge base on low light and low visibility conditions, having worked with brands like Altura and Rapha in this space. The human eye is very good at recognising shapes that look like another human being, which means that, in product design, a person is more adept at identifying a cyclist or a runner when the shape is distinctly human. The market of high visbility clothing is dominated with retro-reflective materials, which is no bad thing, but the application of retro-reflective surfaces can be, should be and often is balanced with aesthetics and visuals from a day-to-day wear perspective. There are a variety of tests that can be run to assess the ability of a jacket to be seen. The first is generating visual imagery that clearly indicates the level of visibility of a garment. This can be quantified through the brightness of pixels as well as the area that can be seen to be reflective. Images that give a clear indication of the visibility of a cyclist need to be taken to represent the way the eye is working at the time. The eye is a highly complex piece of apparatus that has three different types of vision depending on the level of light entering the eye. These are photopic, mesopic and scotopic conditions. Photopic is when the light is bright, or daylight, scotopic is our night vision and mesopic is between the two. What is interesting is that the colour starts to seep from our vision as the level of light drops to scotopic vision, which takes about 30 minutes to fully take effect. A photospectrometer allows us to quantify how much light is reflecting from an object and what the colour of this light is when it hits the eye. Each of these types of vision need to be accounted for in measuring the level of visibility of a garment. During dusk conditions, when the mesopic vision is active, we see colours differently to the day, which means our clothing needs to be designed accordingly. At night, we see reflective objects well, but we need to be able to differentiate these objects between street signs and people. Movement is one way that we can discern this difference. The pumping of a runners arms or a cyclists legs. Another is making the form look human and having the correct methodologies and knowledge to correctly apply reflective material to a garment that maximises visibility is important to us.